One of three very large blocks of flats in Merry Hill. Central Government subsidies ensured that the 1960s became the decade of the high rise flat. Demand for one bed properties had grown through the 1950s and led to a decision to pursue a policy of building flats within the borough. Major flat building projects were undertaken at Merry Hill(1967), Blakenhall and Heath Town. Smaller scale developments took place at Russell Street, Whitmore Reans, Vauxhall(1963), Boscobel and Chetton Green(1964)Estates. The Vauxhall, Boscobel and Chetton Green Estates received Civic Trust Awards. 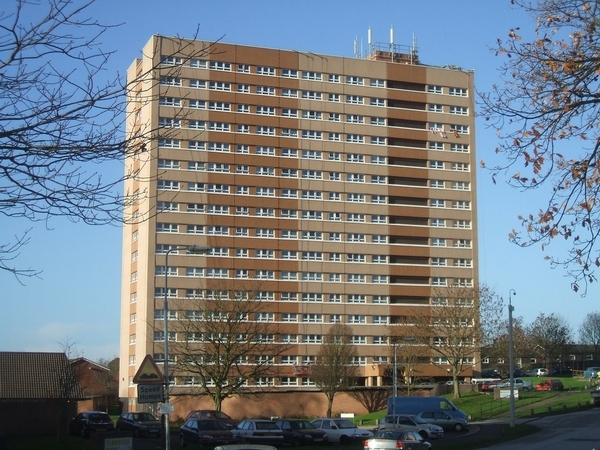 In the neighbouring UDC in Wednesfield three nine storey blocks were built on the Lakeview Estate in 1962 and three twenty storey blocks were constructed between 1964 and 1970. Similar developments took place in Bilston prior to 1966. The flat building programme was relatively short lived and was dealt a blow by the Ronan Point Explosion in 1968. Council reorganisation in 1966 saw the neighbouring UDCs of Wednesfield, Bilston and Tettenhall incorporated into the Borough. This page has been viewed about 892 times.